Irvine, Calif. (May 30, 2011) – Monster Energy/Pro Circuit/Kawasaki’s Tyla Rattray proved his mettle in Texas overcoming blistering heat to win the 250 class overall with a 2-1 finish at Round 2 of the AMA Motocross Championship at Freestone County Raceway in Wortham, Texas. While the sandy track at Freestone County Raceway would prove challenging in its own right, the biggest obstacle that faced all the racers was the overbearing heat and humidity that not even a steady wind could phase. Dean Wilson came out of the gate swinging, gapping the field to win the first moto, but a third-place finish in the second moto left him in the runner-up position behind teammate Rattray. Blake Baggett got good starts in both motos, but crashes left him with a 7-16 and ninth-place overall. Broc Tickle overcame a rough first moto, going 39-5 to finish in 12th place. 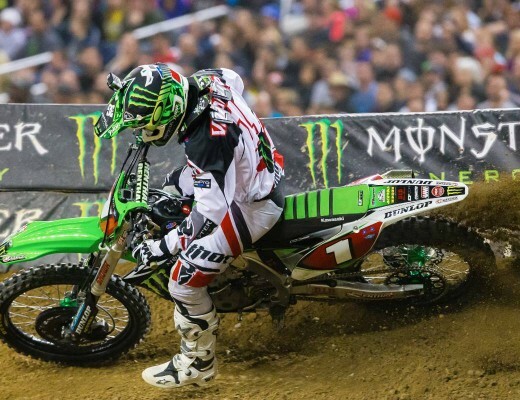 Monster Energy Kawasaki’s Ryan Villopoto grabbed a podium finish in the first moto, but the overwhelming heat took its toll during the second moto, leaving him with a 3-5. The finish was good enough for his second-consecutive podium finish. Jake Weimer continued to show steady improvement since his return to the KX™450F to finish 6-7 and take sixth-place overall. Rattray is a GP world champion who knows what it takes to win outdoors. In the first moto, he rode consistent and smooth to finish in second behind teammate Wilson. By the second moto, the track had deteriorated and the hot, muggy weather was at its worst. As other competitors slowed down showing signs of fatigue, Rattray demonstrated true championship spirit, charging out front to take the win. His impressive racing earned him his third-career overall win and he sits second in points for the season. After a solid day of racing, Wilson walked away with the overall points lead in the 250 class, earning him the coveted red plate. In the first moto, he got out front early and checked out to take the win by over eight seconds. Wilson got off to another great start in the second moto, but went down after getting tangled with another racer. The crash left him fighting for position the remainder of the race. He finished third in the second moto and took second place for the weekend. Since clenching the AMA Supercross championship, Villopoto’s busy schedule has left him little time to recover from an illness that has been affecting him for the last couple weeks. He came out to Freestone feeling better, but not fully recovered. In the first moto, he got pushed to the back of the field right off the start, but charged forward and worked his way through the field to finish in third place. Villopoto got a better start in the second moto, but the extreme heat and a couple mistakes would push his endurance to the limit. He continued to charge forward and finished the race in fifth place. His impressive determination left him in third-place overall, which bumped him into second on the leaderboard. Still building himself back up from an injury that kept him out of racing most of the year, Weimer has shown continuous improvement since stepping up to the 450 class. He was looking good in the Texas heat, riding smooth and consistent in both motos. Weimer finished sixth overall with a 6-7 for the weekend. His steady riding moved him up on the leaderboard into ninth place in the series standings. Tickle started off the day feeling good and ready to get on the podium. He got a decent start in the first moto and was running in sixth when a mechanical issue on the first lap forced him to pull off the track. Despite having the last gate pick for the second moto, he fought his way through the field to finish in fifth place. Tickle’s outstanding effort in the second moto left him in 12th place overall in the 250 class for the weekend. After taking the overall win last week at Hangtown, Baggett came out to Freestone with high expectations. In the first moto, he got off to a great start and was leading the field the first couple laps before a mistake would knock him back into 13th position. He got back on the bike and worked his way up into a seventh-place finish. The second moto he pushed hard to get out front but made a couple mistakes that left him in 16th place in the moto and ninth overall. Everything is bigger in Texas, especially the heat waves. One of the biggest challenges for the racers and fans alike was trying to stay cool as the day grew progressively hotter. Even with the wind picking up by mid-afternoon, the overwhelming heat remained unaffected and the humidity seemed to amplify the level of discomfort. Some of the racers came up with creative solutions to beat the heat between motos, like Tickle and Wilson, who could be found taking ice baths in trash cans while enjoying ice pops. In two weeks the racers head across the country to compete in Round 3 of the AMA Motocross Championship series at High Point Raceway in Mt. Morris, Pa. After a hot weekend in Texas, the racers look forward to cooler temperatures and better traction in the Pennsylvania dirt.